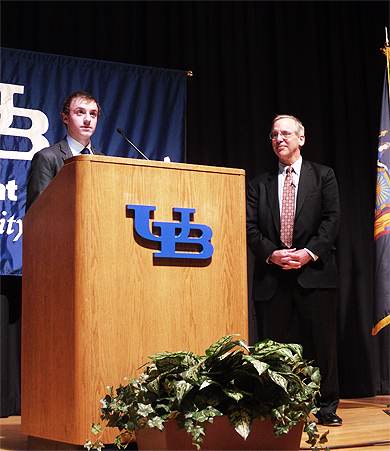 Buffalo—On the final day of his three-day trip to Upstate New York, President William Dudley addressed students on the North campus of the University at Buffalo on Wednesday. Undergraduate student and president of Delta Sigma Pi, University at Buffalo’s business fraternity, Daniel Gengo (pictured) presented Mr. Dudley with a commemorative gift following his remarks. Earlier in the day, Mr. Dudley met with Buffalo area community bankers and visited with workers at the nearby GM Powertrain Tonawanda Engine Plant.